2 tablespoons finely chopped spring onions. 12 medium peeled and de-veined green king prawns. Salt & cracked black pepper (or use Dorrigo pepper as alternative). Ground dried myrtle to taste (between 1 teaspoon & 1 desert spoon). Heat the oil and cook onions until translucent, around a minute will do. Increase the heat and add the prawns and the scallops. 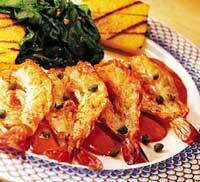 Cook for a minute or until prawns are firm to touch, sprinkle with lemon myrtle. Pour in the wine and cook to reduce the wine a little. This whole process will take 4-5 minutes.